Mustafa Kemal Atatürk was born in 1881, in a three-storey pink-coloured house, located on Islahhane Street in the Kocakasım quarter of the city of Thessaloniki. His parents were Ali Rıza and Zübeyde Hanım. His grand father, Hafız Ahmet Effendi belonged to the Kocacık nomads (yörüks), originally from the vicinity of the cities of Konya and Aydın in Anatolia, who, in the course of the 15th and 16th centuries settled down in the region of Macedonia. His mother Zübeyde Hanım was the daughter a well-known Turkish family, who had for generations been living in the town of Langaza neighbouring Thessaloniki. After having been employed first as a militia officer, and then clerk in the administration of Pious Foundations (Evkaf), Ali Rıza Efendi eventually settled down as a lumber trader, when he got married to Zubeyde Hanım in 1871. 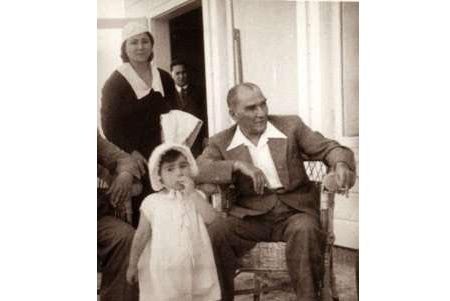 Of Mustafa Kemal’s five siblings four died early, with only his sister Makbule surviving him (1956). Mustafa started his primary education at the Hafız Mehmet Efendi neighbourhood school, transferring to the Şemsi Efendi School on his father’s request. During this time he lost his father (1888). After staying with his uncle at Rapla Farm for a while, he returned to Thessaloniki to finish his primary education. Following his graduation, he was registered to the Civil Service High School of Thessaloniki and in 1893 entered into Military High School. In this school, his mathematics teacher Mustafa added ‘‘Kemal’’ to his name. In 1899, he successfully completed the Manastır Military Highschool and then continued his education at the Military Academy. He obtained the rank of Lieutenant in 1902. He graduated from the said Academy on 11 January 1905, with a rank of Captain. During the period 1905-1907, he was assigned to the 5th army in Damascus and became a Senior Captain (Kolağası). After having been assigned to the IIIrd Army in Macedonia (Manastır), he became a member of the Operation Army (Hareket Ordusu) a Chief of Staff. The Operation Army crushed a rebellion against the constitutional regime in 1909. Mustafa Kemal was then sent France in 1910, where he participated in the Picardie Maneuvers. Upon his return to Istanbul, he was assigned to the Chief of Staff. In the course of the war, which started with the Italian invasion of Tripoli in 1911, Mustafa Kemal and a number of his like-minded friends and colleagues fought in the region of Tobruk and Derne. As a result of his Tobruk victory over the Italians on 22 December 1911, he was promoted to the position of Derne Commander on 6 March 1912. When the Balkan War erupted in October 1912, he joined the war stationed with the units of Gallipoli and Bolayır. His commandership was instrumental in retrieving Dimetoka and Edirne. In 1913, he became a military attaché and was sent to Sofia, Bulgaria. While he was performing his duties he got promoted to the rank of Lieutenant Colonel in 1914. His assignment for acting as a military attaché ended in January 1915. Meanwhile, the First World War was already in progress and the Ottoman Empire had entered the war on side of the Central Powersw (Austro-Hungarian, Germany, Bulgaria). Mustafa Kemal was sent to the city of Tekirdağ to organize the 19th Military Division. During the first world, the legendary heroism displayed by Mustafa Kemal at the Battle of Gallipoli made it clear to the Entente powers (France, Russia, the United Kingdom, and later Italy and the United States) that the Dardanelles would not be breached under any circumstance. When the French and British Navies failed to break through and suffered heavy losses at the Dardanelles straits, they decided to land soldiers on the Gallipoli peninsula. On 25 April 2007, the advancing enemy forces that landed at Arıburnu, were immediately repulsed by the 19th Military Division, headed by Commander Mustafa Kemal. He was made colonel as a result of his brave and clever military performances that gained him the appreciation and respect of all sides, including the enemy. During 6-7 August 1915, British forces re-attacked the Arıburnu region to make headway into Ottoman soil. However, on 9-10 August, Colonel Mustafa Kemal achieved a historical victory against the enemy at Sari Bair (Anafartalar). This achievement was followed by the additional victories at Kireçtepe (Agust 17) and Sari Bair II (August 19) shortly thereafter. Despite suffering nearly 253,000 casualties at the Dardanelles, the Turkish nation was quite successful in defending its honor against the Allied armies. Mustafa Kemal’s special message to his soldiers, ‘‘I do not order you to attack the enemy, I order you to die’’ changed the destiny of trenches. Right after the conclusion of the Dardanelles campaign, Mustafa Kemal took various military assignments in the cities of Edirne and Diyarbakır and became Major General in April 1916. He successfully fought against Russian forces and regained the cities of Muş and Bitlis. Following his short duties in Damascus and Aleppo, he returned to Istanbul in 1917 and took a trip with Sultan Vahdettin to visit the German front. During this trip he got sick and received treatment in Vienna and Karlsbad. He was assigned to the command of the 7th Army in Allepo on 15 August 1918. Here, he engaged in successful defensive battles against the British army. A day after the signature of the Mudros Armistice (Mondros Mütarekesi), he was appointed to command the Thunderbolt Army (Yıldırım Orduları). However, the said army eventually got dissolved and Mustafa Kemal returned to an occupied Istanbul on 13 November 1918 to start working for the Ministry of War. As the Entente Powers began to disarm the Ottoman armies in accordance with the provisions of Mudros Armistice, Mustafa Kemal sailed off for Samsun on 19 May 1919 with the assignment of inspecting the 9th Army. However, he issued the famous Amasya Circular on 22 June 1919 declaring that the country was in danger and the nation had to save itself by its own will and sources. He also organized the Erzurum (23 July – 7 August) and Sivas (4 - 11 September) Congresses to find a way of saving the nation from occupation by the ennemy. On 27 December 1919, he was enthusiastically welcomed in Ankara. And the ensuing opening of Grand National Assembly on 23 April 1920 was a monumental step forward for the establishment of new Turkish Republic. 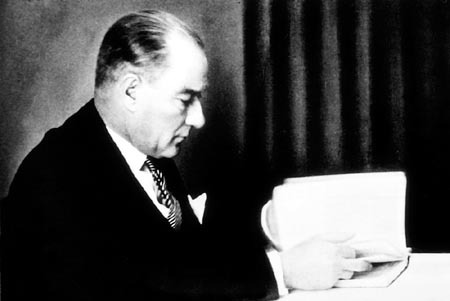 Mustafa Kemal was elected as the head of the Assembly and Government. The said Assembly acted immediately to approve and enforce the regulations necessary for the successful conclusion of the War of Independence. The Turkish War of Independence started with the first bullet shot at the enemy on 15 May 1919 during the Greek occupation of Izmir. At first, the militia forces (Kuvâ-yi-Milliye) fought against the Allied Occupation Forces which tried to divide the Ottoman Empire for themselves pursuant to the signed Treaty of Sevres (10 August 1920). Later on, the Turkish Grand National Assembly established a new national army by uniting the Kuvâ-yi-Milliye and the regular army. This new strategy turned out to be victorious for the occupied Turkish nation. After the victory at the Battle of Sakarya on 19 September 1921, triumphant Mustafa Kemal returned to Ankara where a grateful National Assembly awarded him the rank of the Field Marshall as well as the title of ‘‘Gazi’’ (‘Champion’). The War of Independence ended with the signature of Treaty of Lausanne by all concerned sides on 24 July 1923. Consequently, no obstacle remained in the way of establishing a Turkish state based on the principle of national unity, in lands which once was tried the Treaty of Sevres tried to divide into 5 - 6 provinces. 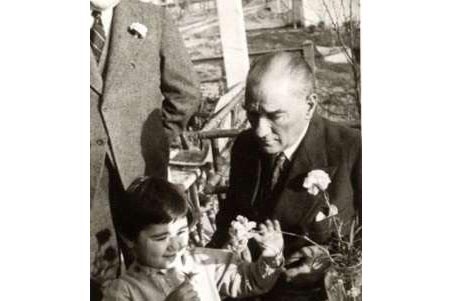 Pursuant to the Law on Family Names, Mustafa Kemal was given the surname of ‘‘Atatürk’’, or the father of all Turks, on 24 November 1934. 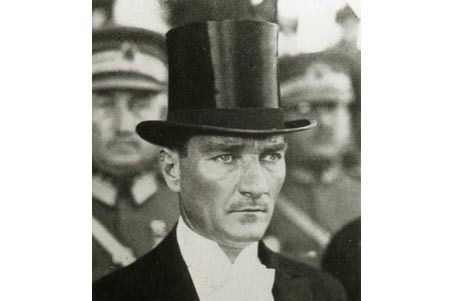 Atatürk became the president of Turkish Grand National Assembly (TBMM) on 24 April 1920 and 13 August 1923. The president was (and still is) the head of state as well as of government. On 29 October 1923 the republic was declared and Ataturk was elected its first president. In conformity with the constitution, the presidency elections were held every four years. 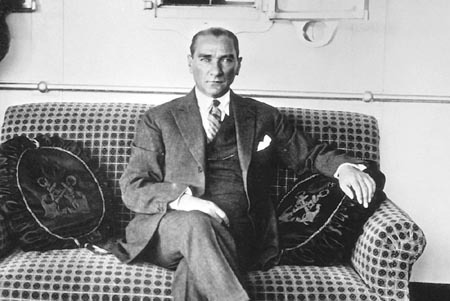 TBMM re-elected Atatürk as president in 1927,1931 and 1935. Atatürk often went on national tours and was thus able to inspect the efficacy of state policies at close range. He ensured that the parts requiring improvements were corrected accordingly. Acting in the capacity of President, he hosted visiting heads of the states, prime ministers, and ministers. Atatürk delivered his famous speech (Nutuk) covering the events between the start of the Turkish War of Independence and foundation of the Republic on 15 - 20 October 1927. He also addressed his 10th year Nutuk to the general public on 29 October 1933. 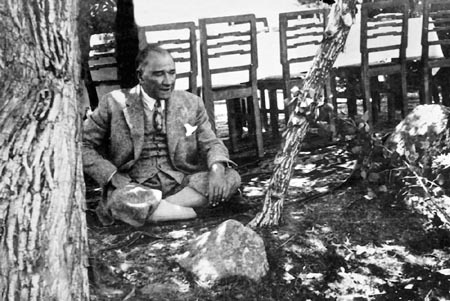 Atatürk enjoyed simplicity in his private life. He got married to Latife Hanım (Lady) on 29 January 1923. They often toured the nation together. Their marriage lasted until 5 August 1925. 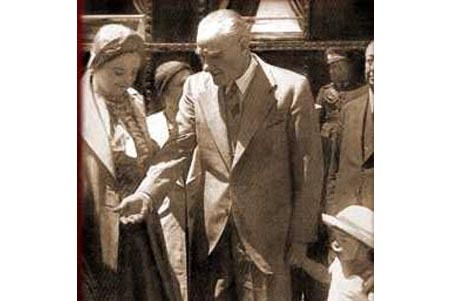 Atatürk had a great fondness for children and became a foster parent to many children, such as Afet (İnan), Sabiha (Gökçen), Fikriye, Ülkü, Nebile, Rukiye, Zehra and Abdurrahim Tunçak. He also took care of the children named Mustafa and ensured that their futures were secure for the rest of their lives. He donated his farms to Turkish Treasury and some of his immobile property to the municipalities of Ankara and Bursa in 1937. He allocated portions of his mobile assets to his sister, to his foster children and to the Turkish Language and History Association. At times of leisure he enjoyed reading books, listening to music, dancing, horse-riding and swimming in particular. He was extremely interested in traditional wrestling, Zeybek folk dances and Rumelian songs. Playing backgammon and billiards were his other main hobbies. He was extremely attached to his horse, Sakarya and dog, Fox. He maintained a rich personal library. He loved to invite statesmen and scientist over for dinner and discuss issues concerning the future of our country. He was a well dressed and a handsome man. 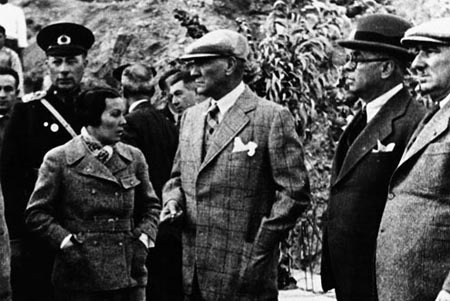 He enjoyed nature and often visited the Atatürk Forestry Farm (AOÇ) to attend the work in person. Atatürk was fluent in German and French. He died of cirrhosis of the liver at the Dolmabahçe Palace in İstanbul on 10 November 1938 at 9:05 am. He was temporarily buried at the Ethnographic Museum of Ankara on 21 November 1938. After the completion of his mausoleum (Anıtkabir) in Ankara, he was taken there to his eternal resting place on 10 November 1953, accompanied by the whole nation participating in the funeral procession. I HAVE BEEN FOLLOWING YOUR AND YOUR PLAYERS’ SERIOUS WORK, AGILITY AND COMPETENCY WITH GREAT ATTENTION AND PLEASURE FOR QUITE SOME TIME. REGARDLESS OF HOW A PERSON IS DEVELOPED INTELLECTUALLY, IF HIS PHYSICAL DEVELOPMENT IS INSUFFICIENT, HE CANNOT CARRY THAT ADVANCED MIND FORWARD AS IN THE CASE OF AN INEFFECTIVE DEFENSE OF FATHERLAND BY A YOUTH LACKING PHYSICAL ACTIVITY AND SPORTS. ALL THESE YOUNGSTERS, YOU ARE TRYING TO BRING UP WITH THE LATEST SCIENTIFIC METHODS, WILL BE ABLE TO DEFEND THIS FATHERLAND ONLY IF THEY ARE COMPLETELY DEVELOPED BOTH PHYSICALLY AND INTELLECTUALLY. AND THEN THEY WILL PROVE THE ETERNAL POWER OF THIS TURKISH NATION AGAINST THEIR EUROPEAN COUNTERPARTS NOT ONLY IN THE SCIENTIFIC FIELD BUT IN ALL KINDS OF SPORTS COMPETITIONS AS WELL. Following the collapse of Ottoman Empire that dominated the three continents for more than six hundred years, the imperialist powers of Europe immediately descended on the country and tried to share what was left. At this specific moment of history, a true leader named Mustafa Kemal stepped forward and liberated the nation with his unique personality, brilliant military and political intelligence and unlimited foresight. Right after the realisation of this miracle, he founded the ‘Democratic Turkish Republic’ and revolutionized the every aspect of Turkish like with modern values. When the Great Leader, Atatürk, was realizing the impossible, the Beşiktaş Club stood behing him without reservation. During the War of Independence, most of the sportsmen whom Atatürk assigned with crucial and difficult tasks had always come from the courageous individuals of the Beşiktaş Gymnastics Club. While FUAT BALKAN and MEHMET ALİ FETGERİ were engaged in a guerilla war against the Greeks with the militia forces they established in Western Thrace, hundreds of other Black and White players such as AHMET FETGERİ, DANİŞ KARABELEN, HÜSEYİN BEREKET, CAMİ BAYKURT and SIRIKÇI İZZET assumed important roles in secret arms shipment from Istanbul to Anatolia. These extremely self-sacrificing tasks were being carried out with the utmost secrecy under the auspieces Atatürk and his two comrades in arms, Fevzi Çakmak and İsmet İnönü. The martyrdom of 8 players from Beşiktaş’s first Football Team in Gallipoli and on the Caucasus fronts and our hockey player Refik’s losing half of his body with a mortar shot at the Battle of Sakarya are just the two of many examples that reinforce their love and loyalty towards Mustafa Kemal Pasha. For these reasons, the Beşiktaş Club has always felt proud at being the first sports’ community that our Great Leader embraced with all his heart. The close cooperation between ATATÜRK and BEŞİKTAŞ goes back to 1915. During the years between 1915 and 1920, Mustafa Kemal [Atatürk], who lived near the Beşiktaş Club on Akaretler Sport Street, entrusted the care for his mother and sister to Black and White personnel without any hesitation when absent on duty. This attachment based on mutual trust and love is further strengthened with the active and documented participation of Beşiktaş’s players in Great Leader’s secret organization that paved the way for liberation. Encouraged by some outspoken representatives of minority communities, a number of Greek officers looted the Beşiktaş Club House. In 1918, the ‘‘First World War’’ ended and the Allies occupied İstanbul on 13 November 1918, in accordance with the provisions of Mudros Armistice. In those days, since its Club House was closed by the occupying forces, Beşiktaş was operating from a small church located in today’s central market. At that time, the Black and Whites experienced an extremely unfortunate event and lost all of its trophies, medals, pennants and plates it won during the years between 1903 and 1918 including valuable documents and photographs. All of the photographs taken by Fuat Balkan which show Atatürk’s visits to the Club also perished in the mayhem. As stated above, Atatürk’s relationship with Beşiktaş started before he was assigned to the command post of Thunderbolt Army, when he was known to world as the ‘‘Defender of Dardanelles’’. Since the ‘‘War of Dardanelles’’ took place between 19 February and 1 December 1915, this document proves that the dialogue between ATATÜRK- BEŞİKTAŞ took place in 1915. In summary, it is hereby documented that BEŞİKTAŞ was the first love and favourite club of our Great Leader, Atatürk. One of founders of Beşiktaş, the fencer FUAT BALKAN was a soldier sportsman. Atatürk maintained close relations with him. During the days of national struggle, following his heroism in Macedonia and Western Thrace, he successfully brought the ‘THREE MILITIA BATTALION’ (ÜÇ MİLİS TABURU) to Turkey from Drama on 17 September 1917. The ‘General Command’ did not know how to congratulate him on this achievement which provided fresh soldiers to the depleted Turkish Army. Besides being a true sportsman, Mr. Fuat Balkan was the most successful guerrilla fighter of our times. Between 1908 and 1923 he served in the various crucial secret missions of his country. After having been assigned to Macedonia during Ottoman times, the TBMM sent him to Greece to prevent Greek forces from entering Turkey by creating disturbances inside their own country. Therefore, he was authorized with the unlimited powers. Following the execution of Treaty of Lausanne, Field Marshal Fevzi Çakmak, with the approval by Atatürk, sent Fuat Balkan a certificate of appreciation thanking him and his comrades-in-arms for their contributions to the fatherland. He received numerous citations of the similar kind throughout his life. This short speech, a copy of which I obtained from writer AHMET FETGERİ AŞENİ, who was also one of the founders of Beşiktaş Club and the first president of Turkish Wrestling Federation, during my interview on ‘Beşiktaş’s History’ in 1961, has become the living testament of Atatürk’s legacy to Black and White community. 19 MAY AND BEŞİKTAŞ J.K.
19 May 1919 is the day when our Great Leader Atatürk started the national struggle against occupation by setting foot in the city of Samsun, an action that gave the Turkish nation the green light for attaining its independence. This key date, which we celebrate throughout the country every year as the ‘‘Youth and Sports Day’’, carries a special meaning for the Turkish nation. This specific day is also very important for Beşiktaş because it is a gift to Turkish citizens from Atatürk, Beşiktaş’s greatest fan of all times. However turning 19 May into a Youth and Sports Day is another great achievement for Beşiktaş. 19 May, Youth and Sports Day was first organized on May 24, 1935 under the title of ‘Atatürk Day.’ In order to express the love and respect felt by the Turkish Youth towards our ‘Eternal Chief’ Atatürk, the Beşiktaş Gymnastics Club decided to organize an ‘Atatürk Sports Day’ and held an meeting in early 1935 with the participation of Istanbul’s Galatasaray and Fenerbahçe sports clubs to realize its goal. Consequently, Beşiktaş’s proposal was accepted and on 24 May 1935 more than 20 thousand spectators gathered at the Fenerbahçe Stadium to watch the specially prepared sports activities. On that day, more than 100 hundred proud Beşiktaş sportsmen wearing Black and White uniforms, and followed by Fenerbahçe and Galatasaray clubs in order, paraded in front of the thousands of applauding spectators with their heads up looking into the bright future. Shortly after this successful organization, the leaders of Turkish Sports Community convened in Ankara for the annual Sports Congress which has been held on a regular basis since 1924. Consequently, the said motion was unanimously approved and submitted to Atatürk who signed it with no hesitation into law. And now, the said youth movement, which was first proposed and realized in May 1935 by Beşiktaş Gymnastic Club, is being celebrated under the title of ‘19 May, Youth and Sports Day’ proudly and enthusiastically all over the nation from generation to generation. According to Atatürk, who said that a ‘‘Sound mind exist only in a healthy body,’’ in order to attain success, one has to stay healthy while this health comes from active participation in sports. That is the reason why each 19 May is saluted with well organized sports demonstrations and ceremonies. In addition to all these, the 19 May is also celebrated as ‘‘Atatürk Remembrance Day’’, because at one time Atatürk stated: ‘‘I was actually born on 19 May”. The 19 May is the day of Turkish nation, youth, sports and most importantly, Beşiktaş. “Mustafa Kemal was attending the 3rd class of the Military Academy. Some nights, the ongoing issues of freedom and tyranny kept him awake until the very early hours of the morning. Meanwhile, the Fatherland and Freedom Association he planned to establish after his graduation, was slowly taking shape in his mind. And he was getting his school-mates ready to actively take part in this organization after they graduated from the academy. In those days, he also learned that the Beşiktaş Bereket Gymnastics Club was founded (1903). This new organization established by the officers and individuals close to Palace drew his utmost attention. How was it possible that these young people got together at the Osman Pasha Mansion, located only hundred meters from the Yıldız Place, and engaged in sports activities under the very noses of Palace detectives who kept opposing virtually everything? At that time Mustafa Kemal was more interested in ideas related to opposing the policies of the Palace than in ideas to do with sports events. However he started to develop a special interest in this club because it was not only founded by military officers he knew but also heavily involved in the branches of wrestling, fencing, shooting, gymnastics, boxing, gallows and weightlifting. Nevertheless, he was more interested in gathering these youngsters together to oppose the autocratic rule of the Sultan, Abdülhamit II. This only increased their commitment to the Beşiktaş Bereket Gymnastics Club. After having founded the Fatherland and Freedom Association in Damascus, he joined the Committee for Union and Progress in 1907, when he transferred to Thessaloniki. During a meeting of theirs he severely criticised the Committee. He said “You have not reached [the standard of] the Beşiktaş Ottoman Physical Training Club. You do not have a programme, not a leadership”. Those days have been recounted as follows by Mithad Şükrü, one of Mustafa Kemal’s colleagues: “What a great power was youth. In those days when flames instead of blood was flowing through our veins, we friends were all gathered together in Thessaloniki. We were continuously organising meetings. We derived the most pleasure from ranting on about the Palace’s administration. These rants, these waivings of our fists to the Sultan, thank heavens, they did not go beyond the walls of our house. Our meeting place was Yanya’s Tavern, where Mustafa Kemal also a habitual guest. Sometimes he would be angry, and say: “You did not live up to [the standards of] the Beşiktaş Bereket Gymnastics Club”. Was not uniting a lofty goal for the youth [of today]. This anthem deeply affected Mustafa Kemal. He lost his sleep. He started thinking about the wars in which he had participated right until the day before, about the soldiers and officers who had died next to him. The anthem he was listening was based on a poem written by the team captain of the Beşiktaş football team, the poet Kazım who perished at Çanakkale. I have been watching the serious efforts, agility and skill of your sportsmen for a long time with great delight and attention. Just like youth deprived of engagement in sports will not be effective in the course of defending the fatherland, the creature named man whose intellectual development may be advanced in a strong degree will not be able to carry forth that intellect if his physical development is wanting and incomplete. These youths in our midst whom we today try to teach using scientific methods, will, once their physical and intellectual development is complete, prove the Turks’ undying strength to our European competitors in terms of defending the fatherland, as well as in scientific areas and in all sports. I congratulate you cordially [for your efforts], and will always be prepared to hear of your successes."
. . . on 16 May 1919 he awoke early in his house in Şişli. 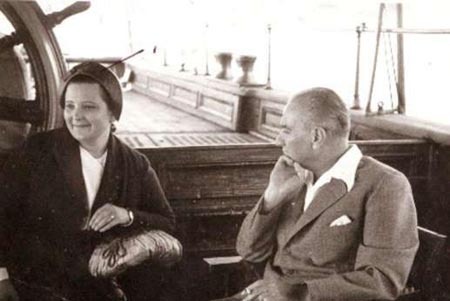 After he had finished his lunch, Mustafa Kemal, who was about to set out for Samsun, called his mother, Zübeyde Hanım, and his aide-de-camp, Cevat Abbas, to his side. He came to the house on Akaretler Avenue. While he had been staying in his house in Şişli, which he had rented as a pension, he had also kept on being the tenant of the house in Beşiktaş. The teachers, sportsmen as well as officers associated with the Beşiktaş Club, situated right next door, had all gathered at his front door to wish him farewell. The Paşa said: “Once more I will entrust you with the safekeeping of my mother. So that I would not be worried about her”. 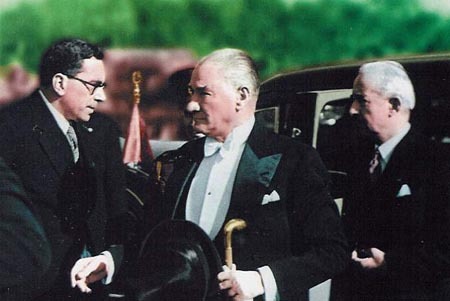 In response, Mustafa Kemal waived his hand sitting in his car, saying “absolutely, absolutely”. It was days after Mustafa Kemal’s departure for Samsun. “We came here to kiss your hands, and to inquire whether there was anything you need”. “After the Paşa left for Anatolia, our neighbours, the members of the Beşiktaş Club stop by on a daily basis, asking such things as Mother Lady do you have any charge for us, is there anything we can do for you? They remind me of the Paşa himself. I love them very much. A good thing I came straight here from Thessaloniki. As he’s done whenever he left for the front, the Paşa has left me in the care of his club”. The eldest of the two visitors to Zübeyde Hanım was the teacher Şekibe Hanım. Her husband, the colonel Galatalı Şevket Bey was imprisoned. The second visitor was Şekibe Hanım’s little sister, the teacher Adile Hanım. Şekibe Hanım was biology teacher at the Kandilli Girls High School, her sister Adile Hanım, on the other hand, was the director of the Kumkapı Primary School. Adile Hanım’s husband was the Captain Necati Bey, whom Zübeyde Hanım loved very much. At that time, Necati Bey had fled to Anatolia so as to participate in the struggle for independence. Her flight from Thessaloniki materialized in front of Zübeyde Hanım’s eyes. The Captain Necati Bey hid Zübeyde Hanım behind the coals of the locomotive in the cold of winter. In 1911, Captain Necati Bey had fought against the Italians in the company of Major Mustafa Kemal in Tripoli. Necati would recount with pride for the rest of his life that he had helped Mustafa Kemal’s mother Zübeyde Hanım escape from Thessaloniki to the house on Akaretler Avenue right next to the premises of the Beşiktaş Club. Captain Necati Bey, who was a fan of Fenerbahçe first learned that his commander was a supporter of Beşiktaş, founded in 1903, when he was a staff captain in 1904-05. The Captain would tell everyone that Mustafa Kemal was a supporter of Beşiktaş because its founders were his colleagues and friends and engaged in the sports of fencing/sword-fighting, weight throwing, and wrestling. In 1964, every Monday the presidents of the various Istanbul clubs that were in the Turkey League would meet in the Mısır Han, belonging to Istanbulspor.